PLEASE, If you have small animal recipes that you would like to share with us, please email them to us at marna@smallanimalfun.com. We would love to have a photo of your small animal to put with your recipes, yes, of course we credit you. For a fun treat for your ratties take a nut, like a Hazel Nut or a Pecan and crack it just a little. Give it to your ratties and watch the fun. Give the ratties at least one per each two ratties in the same cage. Ratties love Yogurt Treats. I give mine human grade Yogurt Covered Raisins. A fun and well received treat for ratties is pumpkin pie filling from the can. I serve it one of two ways. 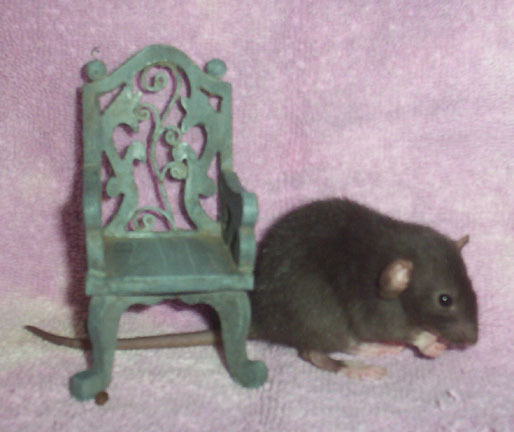 I scoop out just about a t-spoon per each two ratties and put it on a piece of paper plate I have cut up. Or if you empty a can of pumpkin pie filling leave a little in the can and the ratties will have much fun licking the can clean and then sleeping in it. Make sure that the can was not opened so that there are shape edges left on the side of the can. Over my ratties regular feed I add.... In a plastic jar that used to hold fruit but was washed out and dried...I fill it about 1/3 full with Instant Oats, people grade, a handful of small uncooked noodles, a small amount of shelled unsalted sunflower seeds, a small amount of still in the shell unsalted pumpkin shells and then I add what will fit of Cherrio's type cereal. Take and softly shake and turn the jar until well blended. Give a small amount of this every other or every third day over your ratties food. They will love you for it!! Simply give your ratties a milk bone dog treat....they love them. This is a good gnawing treat for them too. Sweet Potato Balls - Thank you Alica!! 1 1/2 cup uncooked oatmeal, corn flakes or granola cereal. Mix all together and add enough fruit or vegetable juice to make it form small balls. Freeze balls individually. Defrost and serve. 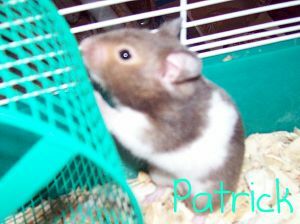 Alica adds, "My hamsters and gerbils seemed to like them, too. I thought they were pretty good, also." The contents of this page for Small Animal Recipes is a work in progress.